Nothing better than winning having been a goal down! A long ball is played down the channel. I had a great view from the Park Lane end, and could see Heskey charging after this ball before Bassong saw him – as soon as Bassong realised that it was a straight race, he seemed to take the chase more seriously. Having got there, this should be out first time – preferably a Row Z job, to allow us to get set for the throw. 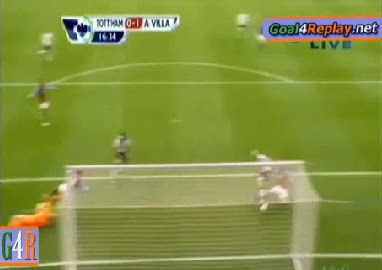 Instead, Bassong tries to bring the ball down and turn away from Heskey. …and is able to carry it away. He hits the by-line, and needs support. At the top of the picture, you can see Marc Albrighton absolutely busting a gut to give him an option. Heskey times it perfectly – takes Huddlestone out of the game (in fairness Huddlestone makes a mistake by trying to shimmy, and fool him into making a pass too early, rather than cutting off the best angle). Hutton’s position is decent – he is goal-side. The ball is weighted perfectly, and is a nightmare for Hutton to deal with. Albrighton goes to ground – Hutton should do the same in my opinion; I can’t see any other way that he can get there first. Instead, Albrighton gets there just ahead of him, and prods it home. The one good thing to come of the goal, was Heskey injuring himself; he had to come off 20 minutes later, and Villa didn’t look nearly as much of a threat. Spurs really stepped up in the second half – Pavlyuchenko had a decent first half, but Redknapp made a great call, bringing Lennon on for him, and pushing van der Vaart higher up the pitch, where he could really hurt Villa. Using Lennon as an impact sub (as I suggested in a previous article), seems to me to be the best way to play him into form, and he almost seemed back to his old self at times, and Collins could easily have been sent off for taking him down when clean through. Great to see our players prove that they can cope with two tough games in a week, and also good to see Redknapp pretty much stick with a winning side (aside from Jenas, who came in and did an excellent job again). Bassong gets way too excited with his dribbles at times when he should just clear the ball. Hudd was a little too far from goal in my opinion... had he just taken a few steps closer, he could have prevented that pass from taking place. So easy to say with hindsight that Bassong should have lumped it; we prefer to play out of those wide situations (Bale & AE do it all the time, and so does Mods) and with Villa clearly stretched this was on the cards. But Heskey out-muscles Bassong too easliy, he has no opportunity to respond quickly, and thenceforth it is about what Hudd and Gomes do. Gomes could have spread himself; Hudd could have stepped forward and blocked. Neither of these were certainties to deal with the problem, but either was better than what happened. And even Hutton could have stepped inside Albrighton, but didn't because it was Hudd's call. One of those things, and one that turned out all right in the end but, in the first half especially, we were often caught upfield a lot, and the gap between defence and attack was dangerous enough that it would be exploited by better teams. In effect this was solved in the second half by taking off the inept Pav, playing Aaron adventurously and sending VdV forward; we also pushed up more and closed the gap. So, surely, Harry's fault for the starting line-up ..... to me, Pav is a luxury we can't afford: a man who needs 6 - 1 in chances except in the final 10 minute substitutions. I thought Hudd held back so as to intercept any pass back towards the penalty spot. Had he moved forward, nearer the goal line, he'd have been helpless in that respect. Also thought Hutton may have improved his chances of intercepting the pass if he'd been willing to use his left foot. Excellent blog and insightful as ever. Did you notice that several times we were caught out from the back, but it didn't result in a goal. Because Huddlestone kept going forward, Bassong was left in the middle on his own and meant one of the full backs had to tuck in, leaving Albrighton, Young etc in space at the far post - we were lucky that they couldn't find the killer ball. Just wanted to mention another point. Houllier is moaning about Van der Vaart's first goal 3 minutes into injury time. 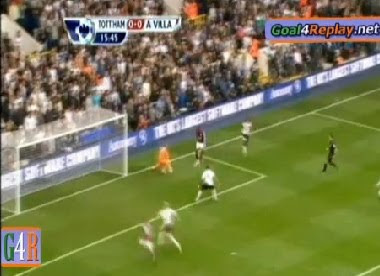 Well I was watching the game on a live stream and when Van der Vaart scored, the time showed 47:01 on the clock. Don't know if anyone else saw it. This was first reported by the daily mail or other rag, can't remember which one and looks like houllier's got on the bandwagon. Don't know why he thinks they had chances to seal the game. As I recall, they only had a two shots on target, one from which they scored. We had loads of chances to seal the game. There seems to be some kind of vendetta against Spurs. When we were given clear cut penalties, there are individuals out there trying to knock us down. But you don't hear anything about the soft penalties given to the gooners against us in the carling cup! Anonymous @ 12:31 - I did indeed notice this. There was one occasions where Bassong was caught upfield, and Young just had to weight the pass to Heskey properly, and he'd have had a one on one. Fortunately for us, he overhit it and put Heskey too far wide. 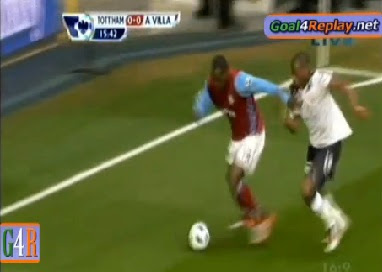 The other bad moment for Bassong was where he let Young easily turn and get a shot away - he probably should have scored. I also noticed that in the second half Thudd was trotting back upfield and AV broke fast, taking him out of the game. Young had the ball out on the left, and Bassong went over to cover. This drew in BAE which left a Villa player totally unmarked at the back post. Luckily offside was given and the play stopped, but had it not we could have been in trouble. This is a problem we seem to have quite a lot and we have conceded in this manner several times already this season. Windy. Good stuff about the game that mattered, but any updates on how the youngsters are doing on loan. Just read something which mentioned how pleased Roy Keane was with Livermore and Townsend's performance for them over the weekend. Loan update is on it's way - give me an hour or so!